Another Promise (AKA Another Family) (또 하나의 약속) arrived in Korean cinemas in February on a wave of controversy. Based on the true story of a young woman who contracted leukemia while working at a Samsung semiconductor plant, and her father’s subsequent battle to bring the chaebol (conglomerate) to justice, the film was mired in difficulties before it even began. With production companies refusing to fund the film writer/director Kim Tae-yoon (김태윤) turned to crowdfunding, and the resulting flood of private donations helped Another Promise to become the first film in Korean cinematic history to be fully fund in this manner. Furthermore, popular actors including Park Cheol-min and Kim Gyoo-ri offered to appear in the film for free which helped to generate even greater public interest. Premiering at the 2013 Busan International Film Festival to favourable reviews, Another Promise received global attention for challenging the most powerful company in Korea, prompting an article from The Guardian which went viral amongst Korean film enthusiasts. Later, when the film was finally granted a nationwide release, Another Promise was again the victim of controversy when it became widely reported that Megabox and Lotte Cinema, two of Korea’s biggest cinema chains, were accused of suppressing the number of screens on which the film was to be played. Despite huge public interest and advance ticket sales, The Hankyoreh reported that Megabox reduced the number of screens from 15 to 3 two days before release (which subsequently changed after public outcry), while Yonhap News stated Lotte Cinema allocated a measly 21 out of 99 theaters to showing the film and that most screenings occurred during early morning or late at night. Yet despite being being shown on a paltry 192 screens throughout February (in contrast, Miss Granny had 1024), Another Promise was the 8th biggest film of the month which is a remarkable achievement indeed. Yet controversy aside, is Another Promise any good? Taxi driver Sang-goo (Park Cheol-min (박철민) is thrilled when his daughter Yoon-mi (Park Hee-jeong (박희정) is offered a job at the Jinsung semiconductor plant. As one of the leading companies in Korea, to be a worker at Jinsung is considered a great boon particularly for a humble family. Yet when Yoon-mi returns home months later extremely ill her worried family take her to hospital, where she is diagnosed with leukemia. As representatives from Jinsung arrive demanding paperwork to be signed and using money as bribes, Sang-goo is determined to discover the cause of his daughter’s disease. 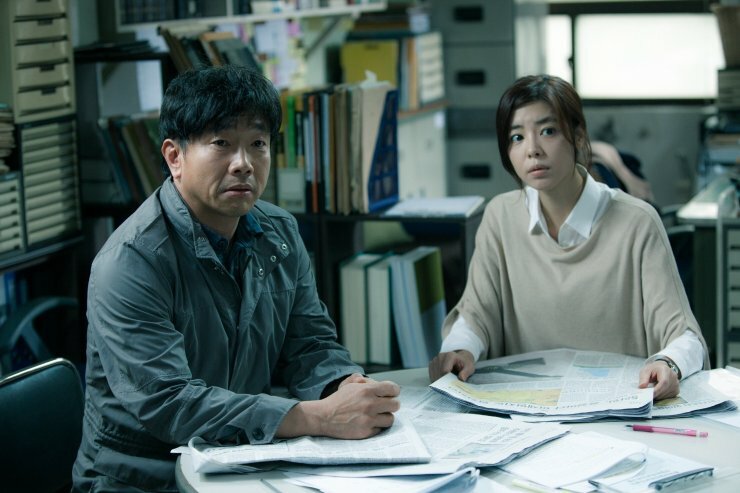 Teaming up with labor rights worker Nan-joo (Kim Gyoo-ri (김규리), the duo track down other sick workers and informants in a desperate attempt to finally bring the conglomerate to justice. Another Promise is a film that very much wears its heart on its sleeve, which is both a blessing and a curse. As it is based on a true story, Another Promise is of course a highly emotional film that undoubtedly resonates strongly, particularly with Korean audiences. However director Kim’s decision to employ melodrama at almost every opportunity undermines the strength of the film’s message, which is a great shame. The most powerful scenes are also the most understated, in which the shocking abuses of power and the traumatized expressions of victims are allowed to speak for themselves, effectively conveying the full strength of the story. Yet far too often melodramatic devices are utilised, and over-simplified caricatures of ‘the perfect family’ and ‘the villain’ are expressed, which tends to make the film feel contrived while the direction and camerawork are competent yet akin to a TV film, also serving to weaken the importance of the story. That said, when scenes are done well they are utterly compelling and poignant, rarely failing to be tear-inducing. Holding the film together is veteran actor Park Cheol-min, who arguably gives a career-best performance as the bereaved father. Park has a tendency to overact and has often been typecast in goofy supporting roles due to this, yet he carries Another Promise on his shoulders extremely well. He occasionally slips into his old habits early in the film yet he hits his stride shortly after, providing a remarkably restrained and emotionally charged performance. His speeches are particularly effective as he solemnly fights for justice, and Park’s sincerity continually forces the film to be compelling. Unfortunately the same cannot be said for the supporting cast who are generally given quite meager roles. Kim Gyoo-ri is surprisingly given sparse screen time as labor rights worker Nan-joo, particularly given her status, although she competently fills the role with the little she’s been given. Other supporting actors fare less well as they tend to serve the purpose of siding with either party, with attempts to expand their backstories proving rather unengaging as there are so many of them it’s impossible to form emotional connections with them all. Another Promise (AKA Another Family) (또 하나의 약속) is an important landmark in Korean cinematic history as the first fully crowdfunded film, and it’s clear writer/director Kim Tae-yoon had no choice but to do so given the subject matter. Based on the true story of a girl who contracted leukemia by working at a Samsung plant and her father’s fight for justice, the film has been mired in controversy from the beginning. The result is a highly emotionally charged drama that is often tear-inducing, yet the addition of melodramatic contrivances tends to undermine the film’s message. Yet thanks to a career best performance by Park Cheol-min, Another Promise is a consistently compelling film.